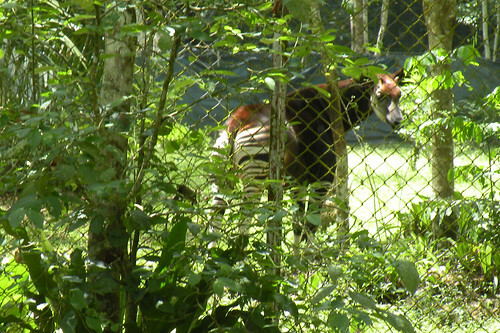 Okapi in Epulu, the administrative center of the Okapi Reserve. Photo by Kim Gjerstad. 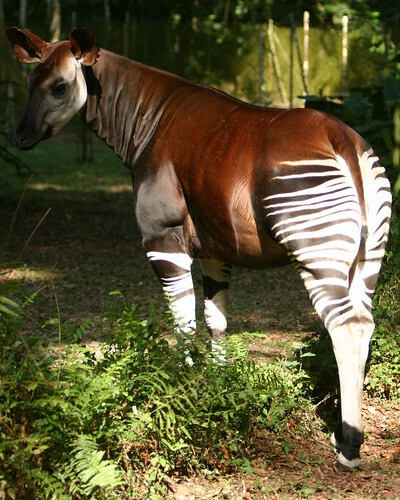 The okapi, or rainforest giraffe, lives only in Congo and is most abundant in the rich forests just northwest of the Rwenzori Mountain. This shy, solitary animal probably reaches its highest density in the Okapi Reserve which contained, before the recent civil war, more than 4000 okapis. Like all Congo’s large mammals, the okapi suffered during the lawless periods of the prolonged war. 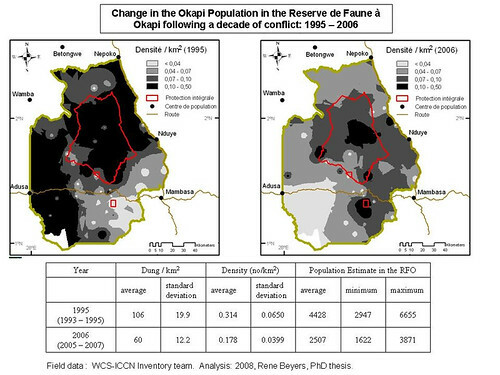 Even in the Okapi Reserve its population was reduced by more than 40% (see maps below). Unlike many places, the Okapi Reserve has undergone an amazing recovery. More land is controlled by the ICCN (Park service) now, than before the beginning of armed conflict. Will this allow the okapi to recover? The town of Epulu prepared for the president’s visit. 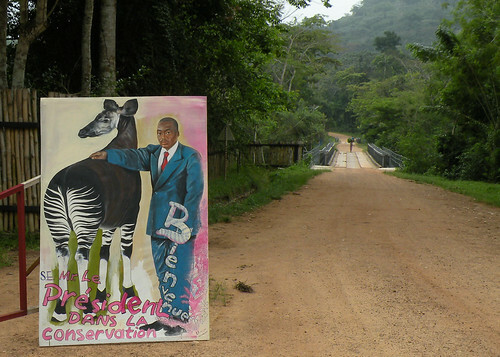 So it was very fitting that the President would stop at the Okapi Reserve headquarters and visit its captive okapi during his tour of the road, the RN4, newly repaired by the World Bank. 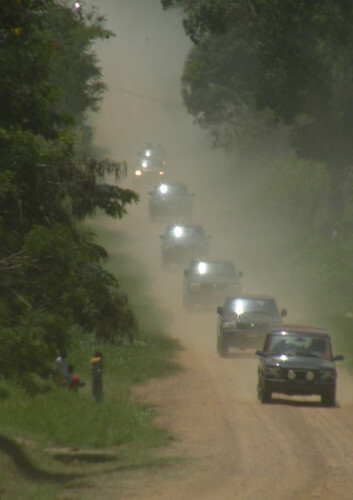 President Kabila’s motorcade drew up in a cloud of dust. 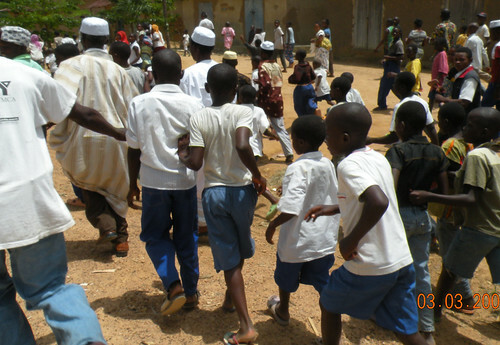 The town of Epulu runs up to where the vehicles stopped. Welcome to the Okapi Reserve, Mr. President. 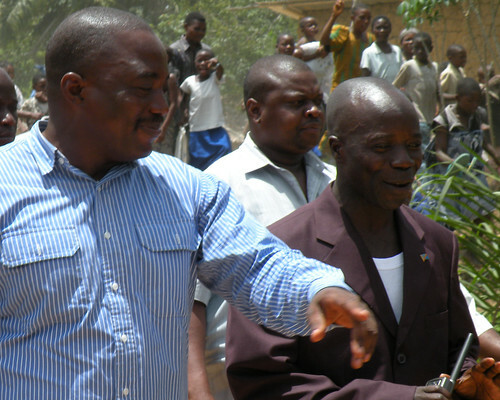 The president walks down to the Reserve’s headquarters with one of the park wardens. And the town of Epulu follows. Rosemarie Ruf explains how the captive okapi were caught, how they are cared for and the history of the okapi station. An okapi watches, fascinated by all the hoop-la. And then the President left. But, among the welcome-paraphernalia that remained on display by the road in Epulu was an old campaign sign. 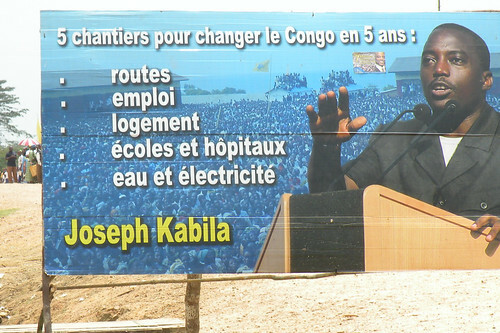 It promised that after five years, the president would change Congo, answering fundamental national needs: roads, employment, lodging, schools/hospitals, and water/electricity. The task seems as daunting as ever. At least, with this road repaired, two and a half years after the election, there is visible progress. But, is this progress for the Okapi ? A smooth road now runs through the very center of their reserve; how will that effect the numbers mapped below? Will the progress the Reserve seemed to be making against poachers still hold? This entry was written by Terese Hart, posted on 2009-03-14 at 9:23 pm, filed under Okapi. Bookmark the permalink. Follow any comments here with the RSS feed for this post. Post a comment or leave a trackback: Trackback URL. Was the bridge repaired (see link)? Not yet, the bridge is still down but there was a “presidential” barge (local construction, of course) able to ferry across those shiny black presidential vehicles, one after another. It’s fascinating how one could pretty much live the moment through your blog! Thanks for your good work Terese. Beside the presence of the ICCN, are there other factors contributory to the quick recovery of the Okapi population? The presence of ICCN is essential, but then also the presence of international partners to make their work possible. Gilman International Conservation and Wildlife Conservation Society are the conservation NGOs on the ground in the RFO. They get their money from a diversity of sources including US zoos and the US gov among others. 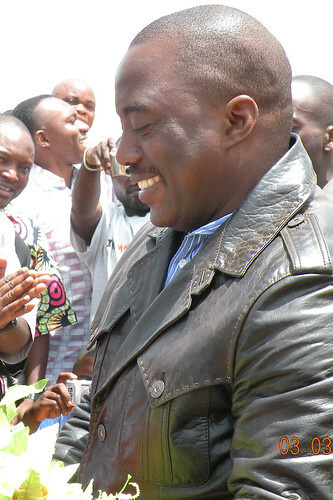 Wow, Somba with Kabila. And Rosemarie too! The work they’ve been doing in Epulu is tremendous, lets hope the road brings with it more good than bad. Yes the road will definitely facilitate bushmeat export among otherthings although the bridge being down at the Ituri does slow down timber export and pressure from that industry. I worked with Alan Root at the Epulu Station 1993-74. 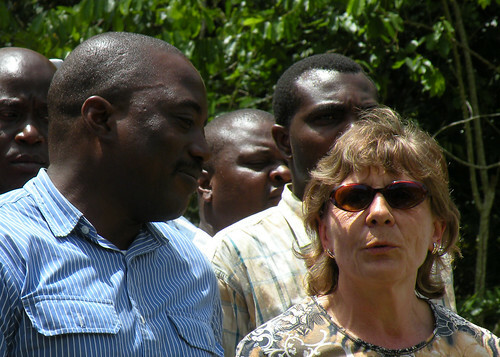 We worker closely with Terese and John Hart and Rosi and her husband at the Okapi Station. I want to plan a visit ,if passable ?I also would like to communicate with the Harts, via e-mail. This note just to say that the bridge over the Ituri has now been fixed for a few weeks. The British government hauled in another Bailey bridge piece by piece. Too soon to say what impact it might have. Leo — have you found my email — top right, at bottom of the About Terese Hart blurb.